Laser Shot is a modern American laser shot shooting simulator with interactive computer video projection. It evaluates acoustically, visually and numerically. Its principle is absolutely simple. A shooter chooses the type of scene, which is projected on a wall or a screen, and uses a laser gun (a pistol, a rifle, a shotgun) to shoot. Hits and the overall shooting success at the end are evaluated by a camera. It works on the principle of a laser beam and it is suitable for use in an environment with usual ambient temperatures. Its menu contains a minimum of 15 shooting topics and many combinations thereof. From hunting topics, you can experience hunting for ducks, pheasants, marmots, deer, wild boar or African safari. From sport events, you can try out target and practical shooting, including shooting at clay pigeons. The system also includes a lot of funny shooting disciplines such as shooting at balloons, cups and moving targets. Laser Shot is a guarantee of great mood and competition. 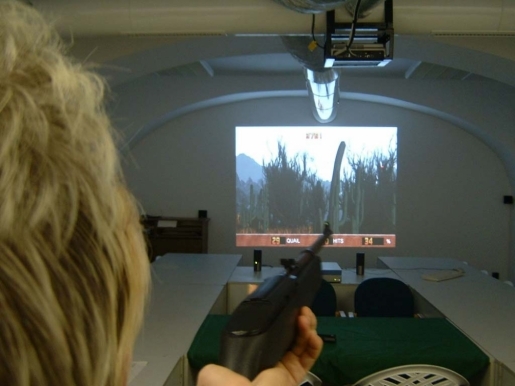 Laser Shot shooting simulator can be rented for any social or corporate event as unusual accompanying attraction.